It’s been quiet on here for a couple weeks. I’ve been taking a crash course on “being still”. Actually, the first week was the opposite of still: hurried, harried, anxious, overwhelmed, unbalanced, uneasy. Then came the lesson: be still. The word “still” in Hebrew means to sink, relax, sink down, let drop, let go. This is reflected in how different versions interpret the phrase. Here’s what I am learning. Be – not “do” still. I can do still. I can make myself sit down, take a breath and appear to be calm. But be still? That means the stillness is in my very being and what appears on the outside is a true reflection of the calmness on the inside. Still – quiet and motionless; a time-out from noise, media, frenzied activity. 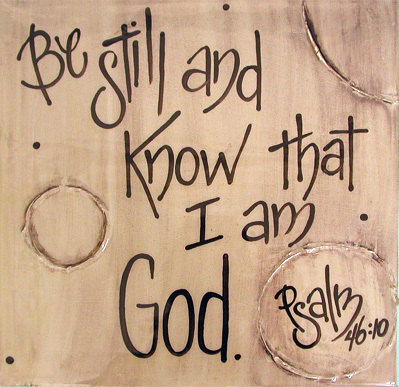 And – The Psalmist doesn’t just say “Be still” period. There’s a reason and a purpose for the stillness. Know – The stillness allows for a knowing. I need clarity, understanding, divine revelation. That’s just not attainable outside of some stillness. God – Creator, Sustainer, Redeemer, Provider, Healer, and on and on. (One website lists 625 names for God.) I get the point – there is nothing outside the realm of His reign. I need to know that. I need to slow down enough and quiet down enough to receive that truth. Be still, and know that I am God. Be still, and know that I am God. Be still, and listen for His voice. Lord, help me to draw near and be still. This entry was posted in Devo Drops and tagged be still. Bookmark the permalink.